Using this same method for a white-powdered-sugar-on-blonde cookies doesn't strike me as contrast-y enough so it's an odd method to use. I think this is where @Kerry Beal‘s comment about the yellow food colouring makes the most sense. It provides that bit of contrast that is so needed. Thanks for your interest and input. Love these discussions. I should add that I don’t think any of the people who tried the cookies are particularly sophisticated and to them citrus is citrus. And I don’t mean that in an unkindly manner. I suspect the key lime association was meant to be complimentary. The rolling in icing sugar prior to baking appears to be an essential part of this recipe as the instructions require that it be done twice with a two minute wait in between. 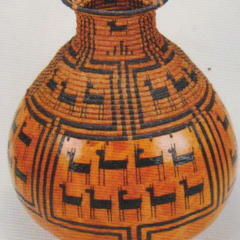 I think it is part of the intended appearance and would not be quite the same if added later. But I don’t claim to be an expert baker by any means. I do like the idea of adding some lemon zest to the icing sugar but I think it would get lost as you require so much icing sugar to properly coat the cookies. Word back from the meeting people is that they were delicious and very much like Key lime pie. I am not sure if that is a compliment. It seems to me that lemon cream cookies that taste like Key lime pie is some sort of epic failure. But what do I know of such things? They apparently disappeared very quickly. NOTHING that tastes like Key lime pie is a failure. This is the treat I had hoped to send with my son-in-law tomorrow. 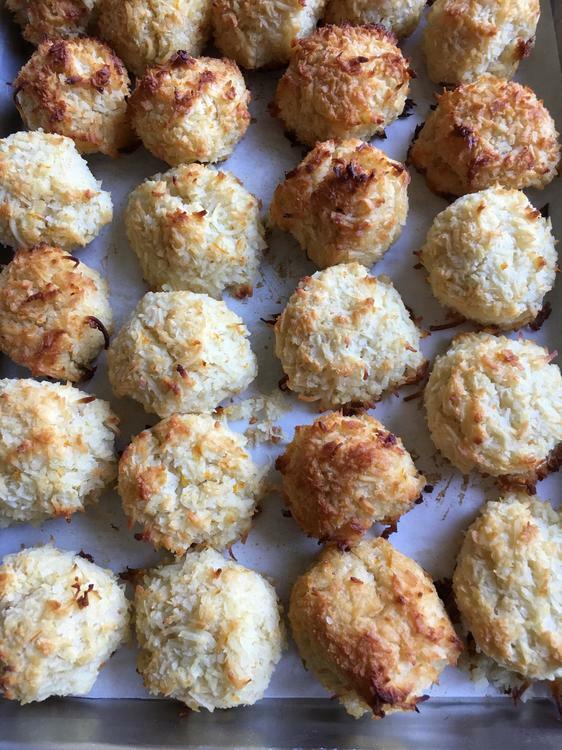 These are supposed to be orange creamsicle coconut macaroons. They taste blah and most crumbled as soon as I touched them. I had collected my mise and I carefully weighed and measured all the ingredients. Nothing should have gone wrong. But I am not one to immediately blame the recipe. As I contemplated what might’ve gone wrong and re-read the ingredients I realized I had completely forgotten the honey. Coconut macaroons can be tooth-achingly sweet but since these were made with coconut milk there was no sweetener of any kind in there. I suspect the honey serves not just as a sweetener but also as a binder and hence the disaster. 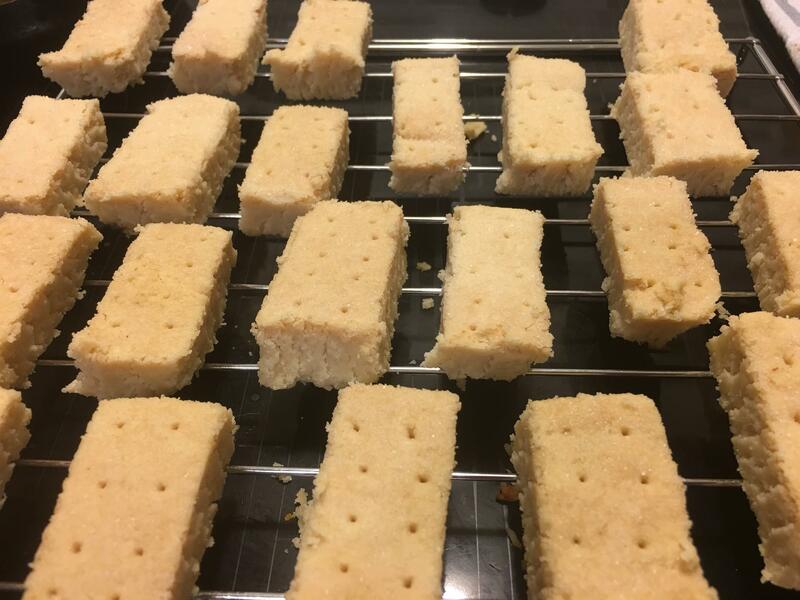 Having used all of my coconut there was no chance of a second attempt so I made shortbread inspired by @Kerry Beal here. I'd take the shortbread any day. I'm with Elsie on this one. 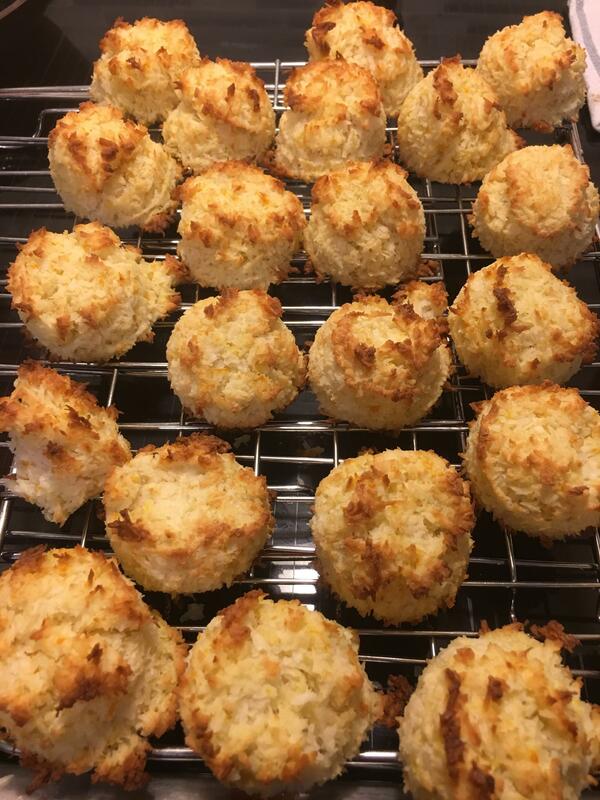 But here’s the thing – – my son-in-law loves coconut, my daughter is avoiding gluten, meeting people will eat just about anything so macaroons check many boxes. Second attempt and second fail. This time it certainly was not a missing ingredient. I think it is time to abandon this recipe. These things for the most part simply disintegrate if you attempt to pick them up. 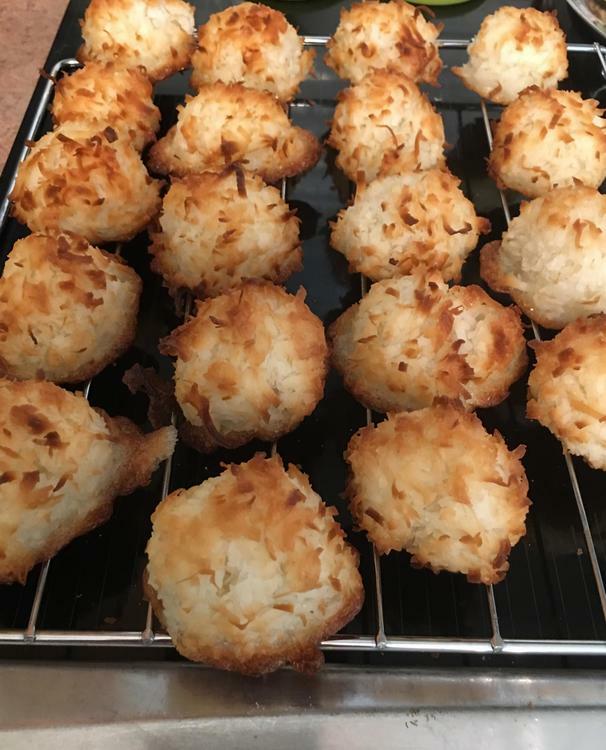 Ridiculous as coconut macaroons have to be one of the easiest cookies to make. There is something missing so I will find another recipe. But not for a while. Coconut is not the cheapest ingredient and I’m tired of throwing it away. I have lots of other recipes for cookies that don’t involve coconut that I am anxious to bake. Once again, I step forward with my usual boring suggestion to not throw the cookies away but to use them in a trifle. Or crumble them and use them as a base for a banana pudding pie. 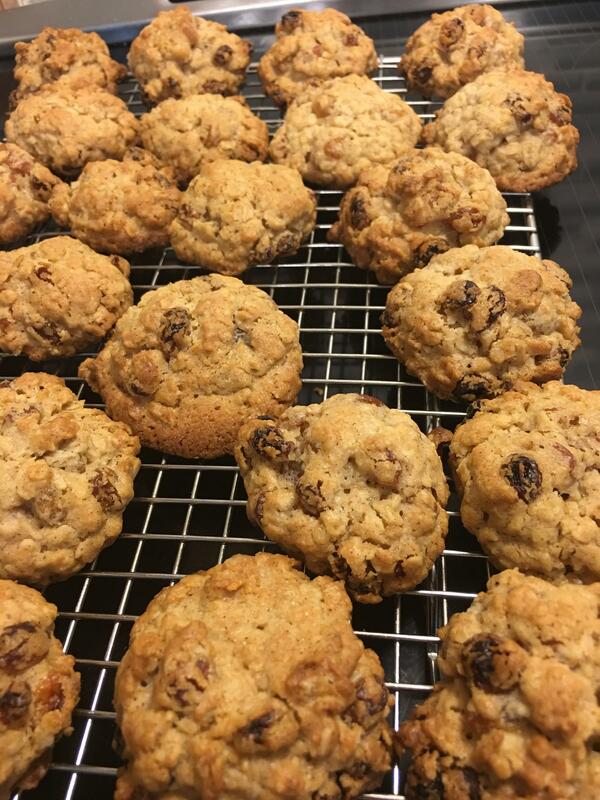 The coconut cookies should go great with banana pudding. Your heart is in the right place. But much as I dislike wasting food I could not bring myself to waste even more good food trying to turn these from a pig’s ear into a silk purse. Actually I’m the kind that would much prefer to turn them into a pig’s ear which I’m sure I’d enjoy. Anna, I wish I could lend you my vacuum cleaner. Otherwise known as my nephew, my husband and several other men in my husband's family. Twelve lousy macaroons? Say no more. Barring that solution, skip the pudding but not the pig. 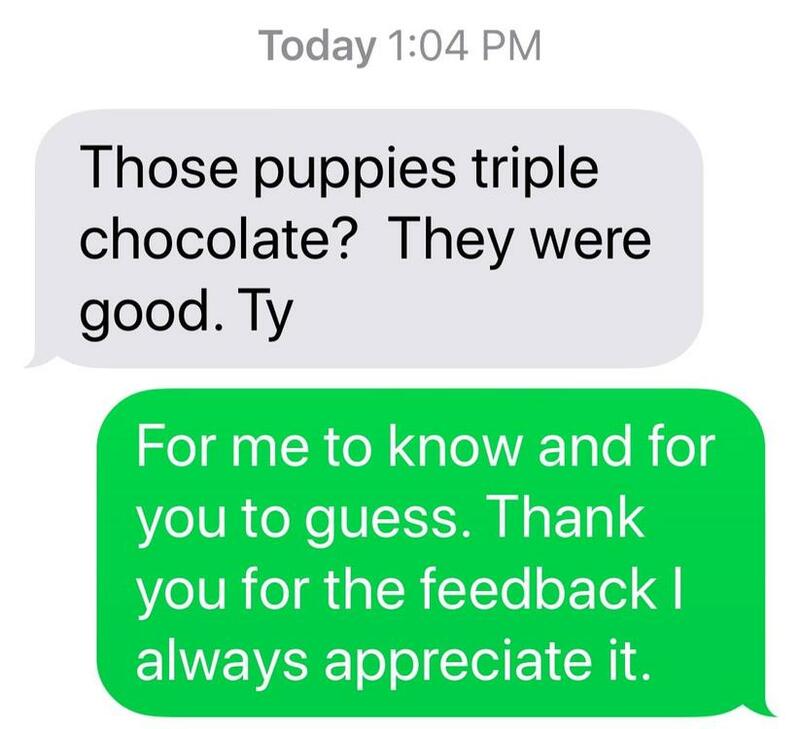 After two consecutive failures I played the safe card today. Thick and Chewy Oatmeal Raisin Cookies from Smitten Kitchen. Just got word that they went over very well. I think I finally nailed coconut macaroons. Nothing but egg whites, sugar, salt, almond extract and sweetened coconut. Anna; what is the final determination of a “meeting friendly snack”? A cookie? Bar? Some sort of easily sliced pound cake? I'm sure @Anna N will weigh in on how things may have evolved but in the meantime, check the first post in this thread for the initial specs. Edited to add that I realize that this is the second time today that someone asked @Anna N a question and I jumped in with my 2 cents. I will stop interrupting. It's long been an issue of mine ! I don’t think there is a final determination. Depends a great deal on what mood I’m in and what supplies I have on hand and what interests me at the present time. I have thought about banana bread and may have even made it but it would have to be sliced by me and I worry that it could easily dry out. I no longer have to worry about nuts or peanut butter allergies as my granddaughter is in high school now and for the most part the rules are not quite so rigid. Yes the rules have changed significantly over time. Things have evolved. Even the company where these meetings occur has changed hands and the attendees are very different. 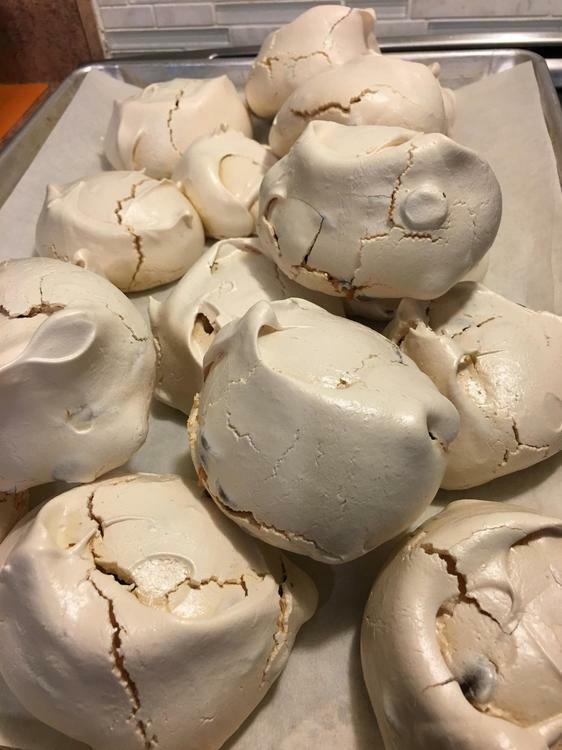 They have learned not to worry about messiness or have managed to cope with it because some of the messiest cookies I have sent have been the ones most praised. The grand child is now a super senior in high school meaning she’s doing an extra year and the students are expected to take full responsibility for themselves so that peanut butter and nut allergies are not so much of a concern. I have been baking long enough now that I’m willing to try things I would never have imagined I would do at the beginning. I still don’t love baking but it doesn’t scare me anymore. Never have to sweat about how these will be received. Deep, dark, decadent. 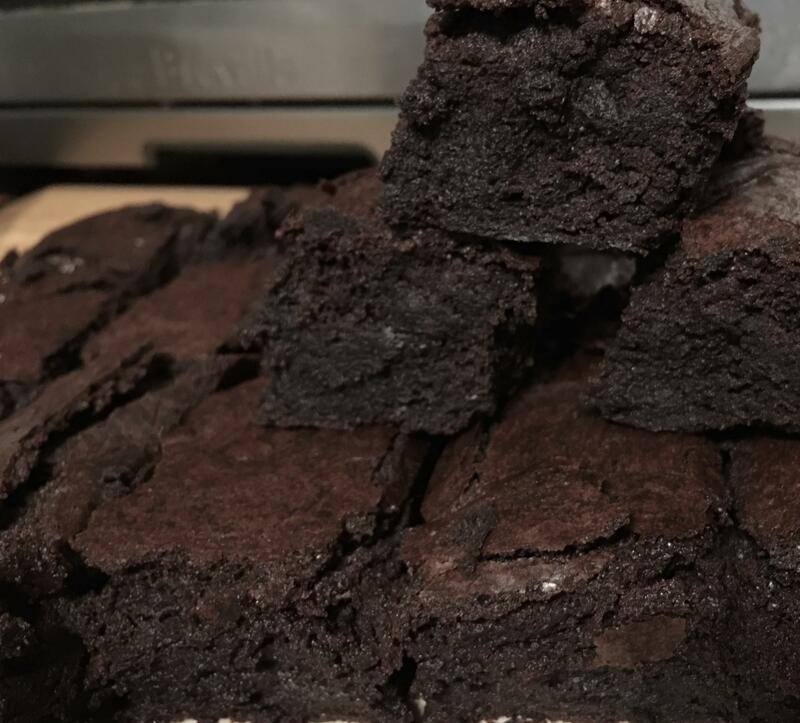 These are the brownies from The Artful Baker. I think it is amusing how much black cocoa powder influences some people’s perception of the “chocolateness”. These were made with high class chocolate and black cocoa powder. @Kerry Beal sent me a link to this recipe and initially I thought it very doable. But I was quickly brought up short about my confidence in my baking skills. Something you need to understand is that I was brought up in postwar rationed Britain. Eggs and sugar were precious commodities. Today eggs are cheap. Most of mine are free as I receive them as gifts. But the old fear kicked in. And I didn’t think I would ever actually start the recipe. When I did start it I was positive I would cook the egg whites until they were scrambled. If I didn’t scramble them in the cooking stage then I would surely over beat them in the mixer. And if I didn’t do that then I would surely undercook or overcook them. I didn’t want to imagine the consequences of wasting a whole cup of egg whites and 2 cups of sugar. I finally talked some reason into my befuddled brain and tackled the recipe. My biggest mistake was making these things at least three times larger than they should be! Not as pretty as they could be and they would never be my favourite cookie but I made them and somebody will surely eat them because they have damn good chocolate in them. It was a no-brainer today. 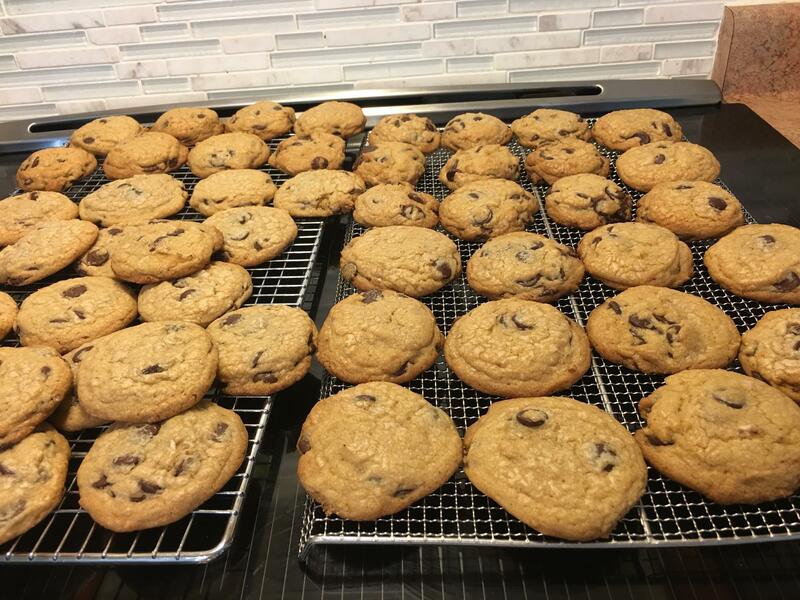 Chewy chocolate chip cookies made with some fabulous Ecuadorean chocolate. Of course I could probably have made them with compound chocolate and they would still disappear almost as fast. But I have some pride and my granddaughter will eat more than her share no doubt. the ones above look perfect . I can just imagine the aromas . followed by home-made Brownies Id say.